Have you ever thought of having your wedding at a quirky wedding venue such as a railway station? Looking for a cool unusual quirky wedding venue in the heart of Staffordshire? Cheryl and Andy wanted their wedding to be one to remember, fun, relaxed and different. 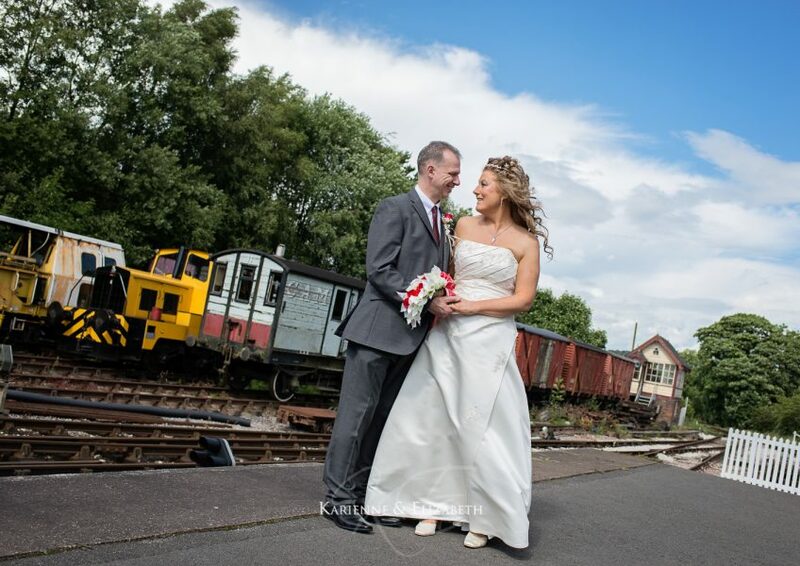 They chose to have their wedding day at the vintage Foxfield Steam Railway Wedding Venue. We loved it! Choo choo…all aboard the wedding train. The sun shone, the wind blew and the rain came down but it certainly didn’t put a dampener on Cheryl and Andrew’s wedding day at the quirky Foxfield Railway Wedding venue. This is where time stands still in the land of the steam railway. Cheryl, Andy and all of their guests enjoyed afternoon cakes and tea while gently chugging along the beautiful Staffordshire countryside on the Bellerophon. Their is something seriously romantic about watching the steam billow over the train and up in to the blue sky above. The sound of the engine, smell of the steam and the laughter from all of the carriages, it was all pretty fantastic to watch and to photograph. To see more of our wedding photography please visit our Facebook page and have a look through the albums of all our recent photo shoots and weddings. Contact us if you would like to check our availability to photograph your Wedding day.